Researchers wishing to fit regression models to survival data have long faced the difficult task of choosing between the Cox model and a parametric survival model such as Weibull. Cox models can be fit using Stata’s stcox command, and parametric models are fit using streg, which offers five parametric forms in addition to Weibull. While the Cox model makes minimal assumptions about the form of the baseline hazard function, prediction of hazards and other related functions for a given set of covariates is hindered by this lack of assumptions; the resulting estimated curves are not smooth and do not possess information about what occurs between the observed failure times. Parametric models offer nice, smooth predictions by assuming a functional form of the hazard, but often the assumed form is too structured for use with real data, especially if there exist significant changes in the shape of the hazard over time. This text is concerned with obtaining a compromise between Cox and parametric models that retains the desired features of both types of models. The book is aimed at researchers who are familiar with the basic concepts of survival analysis and with the stcox and streg commands in Stata. As such, it is an excellent complement to An Introduction to Survival Analysis Using Stata, by Cleves et al. (2010). This book is written for Stata 12, but is fully compatible with Stata 11 as well. Much of the text is dedicated to estimation with Royston–Parmar models using the stpm2 command, which is maintained by the authors and available from the Statistical Software Components (SSC) archive at http://www.repec.org. Royston–Parmar models are highly flexible alternatives to the exponential, Weibull, loglogistic, and lognormal models (fit using streg) that allow extension from proportional hazards to proportional odds and to scaled probit models. Additional flexibility is obtained by the use of restricted cubic spline functions as alternatives to the linear functions of log time used in standard models. The authors demonstrate fitting these models and graphing predicted hazards, cumulative hazards, and survival functions with real data from breast cancer and prostate cancer studies. 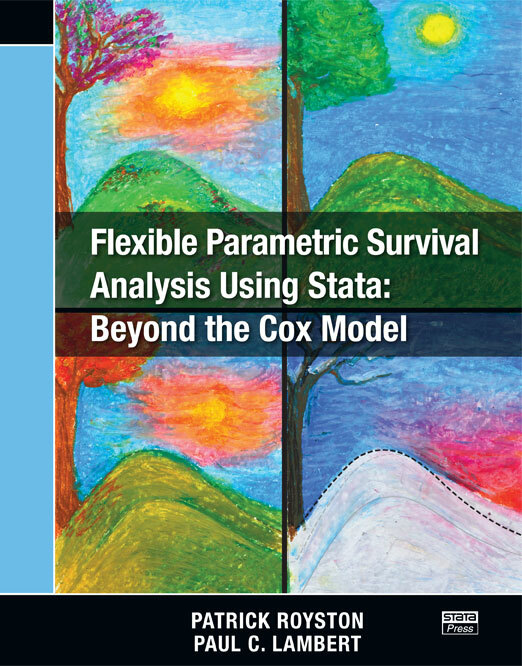 After some introductory material on the motivation behind flexible parametric models and on working with survival data in Stata, the authors proceed by demonstrating that Cox models may instead be expressed as Poisson models by splitting the time scale at the observed failures. The Poisson-model expression allows extension by changing how the time scale is split and by introducing restricted cubic splines and fractional polynomials. Royston–Parmar models are then introduced, followed by material on model building and diagnostics for these models. Considerable attention is then given to time-dependent effects, how these may be modeled, and how to interpret the graphs of the predicted functions the models produce. This material is followed by a chapter on relative survival models such as those used for population-based cancer studies. This chapter is very thorough, relates well to the previous material, and is an ideal introduction for those new to the concepts of relative survival and excess mortality. The final chapter is devoted to advanced topics such as determining the number needed to treat (NNT), handling multiple-event data, and analyzing competing risks. Why not standard parametric models? What is the stset command? What does the baseline hazard function mean? What do we mean by a TD effect? This text is concerned with obtaining a compromise between Cox and parametric models that retains the desired features of both types of models. The book is aimed at researchers who are familiar with the basic concepts of survival analysis and with the stcox and streg commands in Stata.